We cover Hornchurch, Rainham, Romford, Brentwood, Upminster and the south Essex area. We can supply, or supply and install a wide range to suit all tastes and budget. We are a family run business and established over 20 years, we are manufacturers, suppliers and fitters of all heavy duty fencing products. We are a family run business that has grown through hard work for the past 20 years, relying solely on word of mouth business and recommendations. 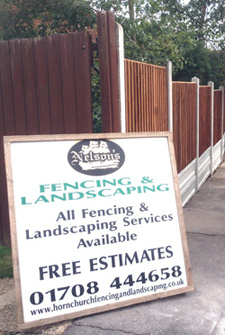 All our fencing is handmade to measure within our garden centre. We have carried out many projects in the local community and most of our work is by recommendation. We are proud of our work and many projects can be viewed locally. Our services include, hard and soft landscaping, tree surgery, driveways, turfing, timber buildings, brickwork, decking, natural stone and paving.